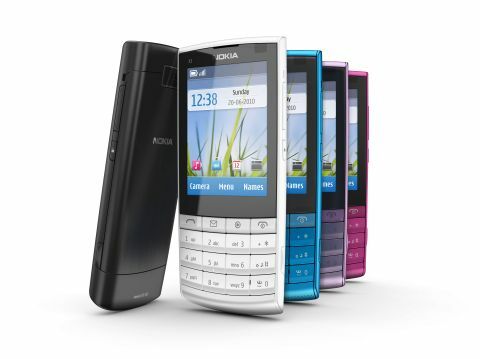 Nokia brings back touchscreen Symbian S40 again, but is Android too far ahead? The Nokia X3 Touch and Type is one for Nokia fans and those who fear the freedom Android offers. The Nokia X3 Touch and Type is not to be confused with the Nokia X3, a music-friendly handset that we reviewed early in 2010. Rather strangely, Nokia has a multiple nomenclature for its handsets these days, and the X3 Touch and Type is also known as the X3-02. No, we can't explain why Nokia wants to confuse you, but we wish they'd stop it. If you've been feeling a little overwhelmed by high-end smartphones lately, and think that even Nokia is concentrating on the top end with the likes of the Nokia N8, then rest easy. The Nokia X3 Touch and Type is a good old fashioned candybar handset. Its S40 operating system has had a touchscreen makeover so that, even if the handset looks old hat, its screen can be prodded and sweeped with the best of them. And it has a music-friendly emphasis with a dedicated music player button, a music widget for the Home screen, FM radio, and even 10 free Ovi Music songs thanks to a voucher in the box. Elsewhere, you'll find a reasonable range of features. HSDPA gives you downloads to 10.2Mbps and uploads to 2Mbps. There is a Wi-Fi connection, supporting b, g and n protocols. There's only 50MB of internal storage, but an easily accessible microSD card slot lets you add more, and a 2GB card starts the storage ball rolling. There's a five-megapixel camera too. And the physical design is appealing. The Nokia X3 Touch and Type is lightweight at a mere 78g, thanks in no small part to its mostly plastic chassis. It is small for the hand and pocket at just 9.6mm thick, 48.4mm wide and 106.2mm tall. Our review sample was a startling popstar-teeth white version, but you can also get blue, black, lilac and a very frighteningly bright pink. Our white version had a grey metal backplate. In the other colours, the backplate blends in with the main chassis shade. It isn't all hugely appealing, though, even on paper before you start to dig around. The small screen looks set to be a bit of a bind at times, and we have not been huge fans of the touch version of S40 in the past. There is also the question price versus features. The Nokia X3 Touch and Type costs just £139 SIM-free, which sounds like a bargain… until you realise that Orange's fantastic Android-toting San Francisco is £99 on Pay As You Go and you can add apps to it till the cows come home.